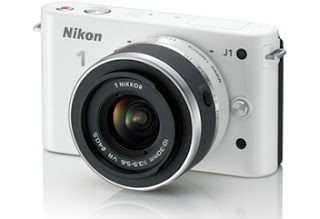 September 24, 2011 /Photography News/ Nikon Corporation announced the release of the first two models in the new Nikon 1 series, the J1 and V1. Nikon 1 is an advanced interchangeable lens that proposes new forms of imaging expression with a new super high-speed AF CMOS image sensor, the new high-speed image-processing engine, EXPEED 3, and the new Nikon 1 mount lens system. The new Nikon 1 brand joins existing Nikon D-series digital-SLR cameras and the COOLPIX brand of compact digital cameras as the third brand in Nikon's digital camera arsenal. Both cameras feature an all-new 10MP CX- format CMOS imaging sensor; 10 full-res frames-per-second capture rates; a dedicated Nikon System 1 lens mount designed specifically for use with the new CX-format sensor; JPEG, NEF(RAW), or NEF(RAW)+JPEG stills; full HD video (1,920 x 1,080/60i, 1,920 x 1,080/30p, 1,280 x 720/60p; a Smart Photo Selector that automatically captures a high-res still while recording HD 1080p video; and a new dual-core EXPEED 3 image processor, which according to Nikon is tuned to enable the new cameras to perform as advertised. Other features include a new 73-point hybrid AF system that automatically switches between phase and contrast detection as needed and full-time continuous focusing, and an ISO range of 100-3200 (expandable to ISO 6400). In addition to the abovementioned attributes, the Nikon V1 features a high-definition 1,4400,000-dot electronic viewfinder (EVF) that comes into play when you raise the camera to your eye, along with a more traditional 3.0”, 920,000-dot rear-mounted LCD. 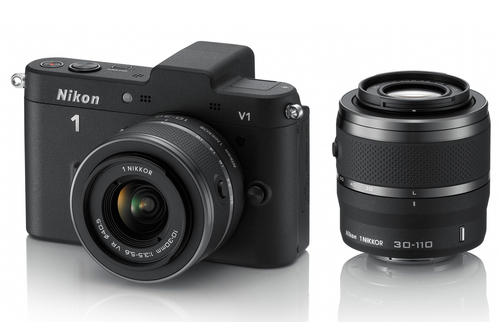 The less expensive version, the Nikon J1, features a 3.0”, 460,000-dot LCD and does not have an EVF. In addition to a standard 10-30mm kit lens (27-81mm equivalent), there’s also a 1 Nikkor 10mm/f2.8 pancake lens (27mm equivalent), a 1 Nikkor 30 – 110mm/f3.8-5.6 (81-297mm equivalent), and a 1 Nikkor VR 10-100mm/4.5-5.6 (27-270mm equivalent) power zoom, which is optimized for smooth, quiet video capture. New Nikon Nikkor mirrorless lenses. Accessories for Nikon’s System 1 cameras include an SB-N5 Speedlight, an external stereo microphone for greater audio fidelity, and the GP-N100 GPS module, each of which couples to the camera via a Multi-Accessory port located on the camera’s top deck.